Foundation: 5ch, sl st into 1st chain to form a circle. Row 2: Join yarn in any 3ch sp; 3ch (counts as 1dc), 2dc, 3ch, 3dc into same place as join; (3dc, 3ch, 3dc into next 3ch sp) x4; sl st into the top of 3ch at start to close; break off yarn. Row 3: Join yarn in any 3ch sp; 3ch (counts as 1dc), 2dc, 4ch, 3dc into same place as join; 1sc spike into top of "middle" dc on row 1; (3dc, 4ch, 3dc into next 3ch sp; 1sc spike into top of "middle dc on row 1) x4; sl st into the top of 3ch at start to close; break off yarn. Note: A picot is formed by crocheting 3ch then sl st into the top of the last sc, in exactly the same way as the 15ch loop is made. 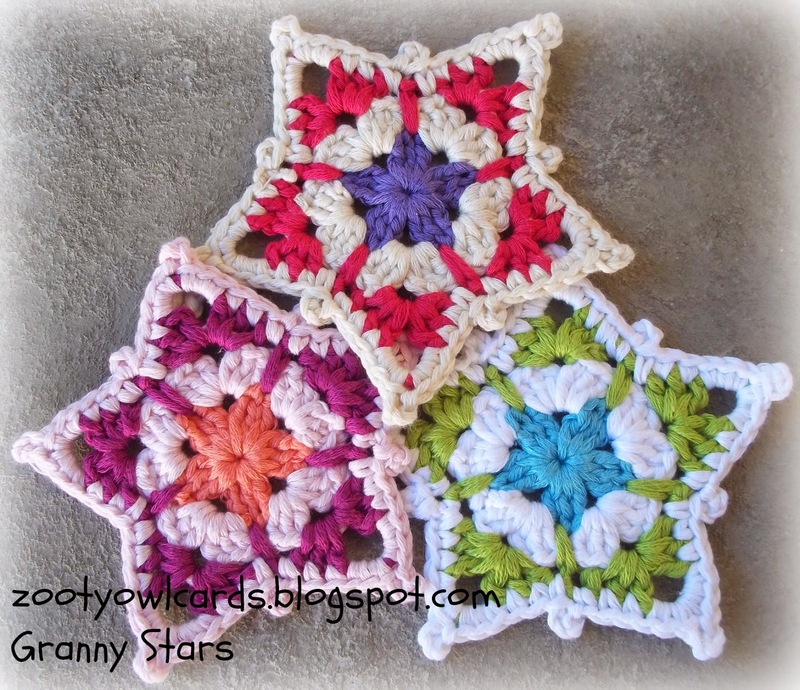 The 15ch loop can be replaced with a 3ch picot if you want to use the star for an applique. Thanks for the pattern. I'm going to make them with metallic fiber so they will be ornaments. I plan to attach them to wrapped Christmas gifts. They look really cute. I'm gonna print it. Thank you for the pattern!!!!!! Have a really nice evening! Thanks for thispattern - I'm going to print it off and start making some. Thanks so much for sharing this pretty pattern. I have made several of them and love the pattern.